A fireplace adds not only warmth, but ambiance to your home. Adding the right tile or stone surround creates an eye catching focal point. Because there are so many fireplace types and configurations, it just makes sense that a custom fireplace surround is the best way to finish off this center piece of your home. At House Of Carpets, we work with the top manufactures and suppliers in the tile and stone industry along with a professional team of craftsmen to guide you through the entire process. 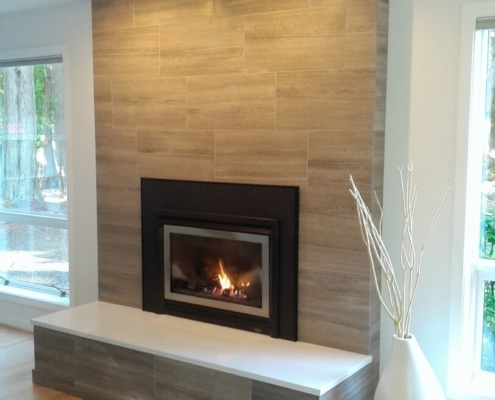 With the selection of stone and tile variation we have available, you are sure to get the look and feel you want for your fireplace surround. Do you have a specific design you are looking for? We can help. Stop by our store or give us a call to schedule an design session. We have been serving Cedar Rapids for decades and take pride in offering a wide variety of ceramic tile, porcelain tile and natural stone. Through the combination of color, texture and medium, get a unique design that fits right in with the decor of your home. With so many options, the only limit is your imagination. Our professional design team has help hundreds of homeowners over the years create custom solutions for tile and natural stone fireplaces. Gather up your idea folder or visit our showroom for some inspiration. Let us help you make your vision a reality!